With the very little time I’ve had learning, reading, listening and more to John & Julie Gottman, I was sold on all that they had to offer. These guys were nailing everything! Which then lead me to purchase everything in they had regarding marriage books and tools. 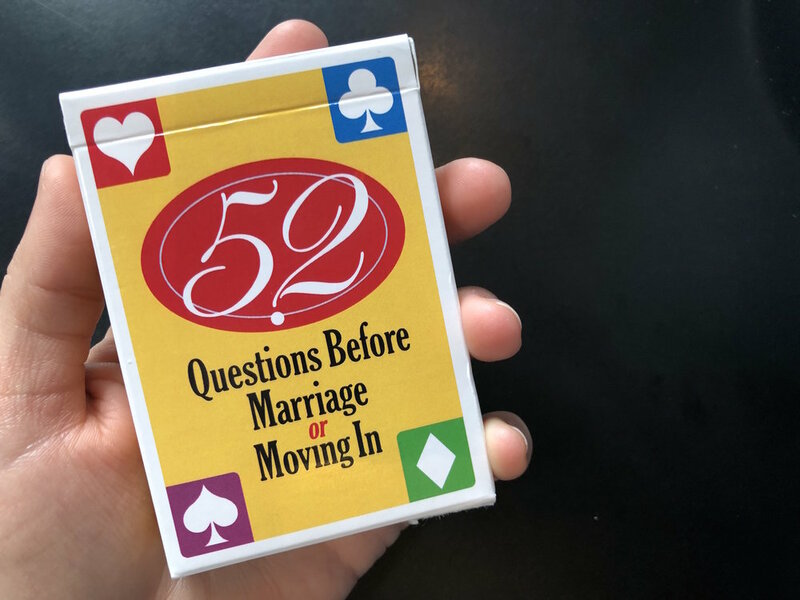 The one purchase I was most excited about was their game “52 Questions Before Marriage or Moving In.” Really long name, but I figured the contents were going to be great, regardless. My first impression when I got the game, was that it wasn’t setup to be a game at all. It was simply a deck of cards with questions on them (good questions, for sure, but not what I was expecting). I was really hoping there would be directions on how to incorporate these questions into your conversations with your signifiant other (S.O. ), but there weren’t. This was a huge buzz kill to me since I was really wanting to gift this to my couples of 2019, but If I can’t or won’t use it with my own marriage, who am I to suggest it to others with theirs?! I figured I couldn’t write this tool off until I used it myself, so I took Tom to get brunch and we “played” with the cards the way we felt was most promising, trying different tactics when things went stale. After chicken and waffles and two rounds of Bloody Marys (THANKS, LILLY’S BISTRO), we concluded that, though the questions are GREAT to go through before taking this big step, it was hard to make it into something fun that you could do with your spouse. HOWEVER, we did come up with a fun challenge you can take with the card set that will be productive, yet fun! Since there are 52 cards in the deck and 52 weeks in a year, it would be so beneficial, low maintenance, and through-provoking to take on a card a week. Take a card on Sunday and look it over. If it’s a topic you can discuss in the moment, do so! If not, use the week to research and reflect, and discuss it over a night out at your favorite restaurant. Any excuse not to cook, right!? Don’t write off this tool as quick as I did, but have fun making it fit to your life and relationship! Get it HERE.